District 11 member Mary Rose Oakar of Cleveland (foreground) telling Sen. Peggy Lehner (back) about public complaints over PARCC test. Ohio public schools are in their third week of issuing standardized tests for students in fourth through sixth grades, eighth grade, and high school. The state legislature passed a law one year ago that eliminates any ramifications for the pupils in this first year of the test. 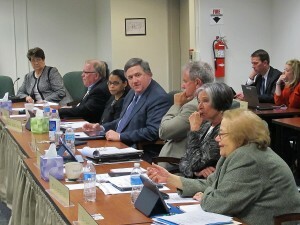 But that hasn’t calmed down members of the state board of education at their meeting this week. It’s known as the PARCC test, which stands for Partnership for Assessment of Readiness for College and Careers. It’s meant to test what kids have learned in the now-statewide Common Core curriculum. Throughout Ohio about 60 % of the districts are taking the test online and 40% on paper with few problems so far says Jim Wright of the Ohio Department of Education. But Board of Education members aren’t so sure. Mary Rose Oakar of Cleveland turned to State Senator Peggy Lehner and said there must be some issues with the test rollout. “Otherwise I wouldn’t be getting boxes of test mania, letters from thoughtful parents, students, teachers," Oakar said. "I mean, boxes." Lehner, chairman of the Senate Education Committee, believes it’s a vocal few who are complaining and did so even before the exams were given. Some opposition to the PARCC test comes from groups opposed to the Common Core standards that Ohio educators adopted. Others just believe students take too many high stakes, standardized tests. Lehner asked that the board members allow the tests to run their course over the next two weeks so officials can study how well they worked. But new board member Bob Hagan of Youngstown said every time he goes to the grocery store he’s accosted by upset parents, students, and teachers. But last year and again earlier this month, Senator Lehner pointed out, the state legislature passed a law so this first-year test will not have ramifications on students’ grades or their ability to graduate. That’s not entirely true. In fact, the test will count toward teacher evaluations unless the teacher works out a deal with the school district. It was conservative Republicans, like the late State Senator Gene Watts, who wanted strict statewide standards and testing, going back to the 1990’s. And some still back them. One of the eight board members appointed by Governor Kasich, Melanie Bolender, of Mt Vernon, expressed support for the exams. The Senate has formed a committee that includes board members, teachers, and curriculum experts to investigate whether the PARCC test works for Ohio. They’ll issue a report in May. After that the committee will look for ways to follow up on the State School Superintendent’s goal of cutting back by 20% all standardized tests in Ohio.